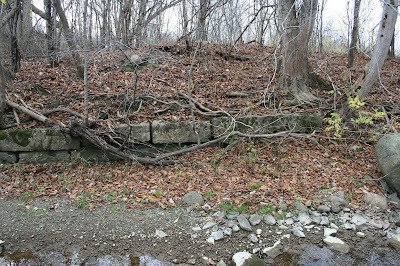 Cayuga County Canal Tours: The Cranebrook Aqueducts and the Location of Clinton' s Ditch Lock 61. 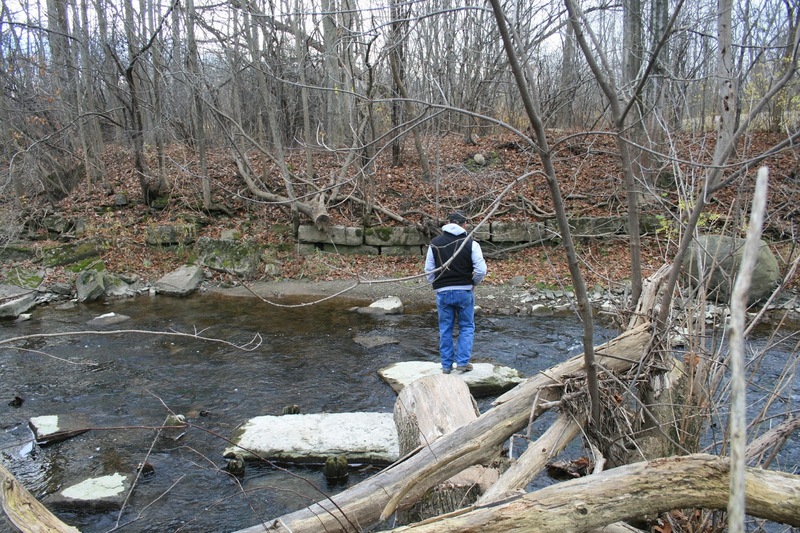 A series of walking and driving tours covering canal sites in Cayuga County, NY. 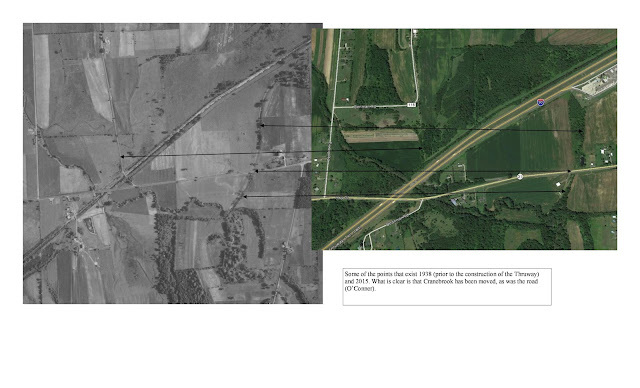 The Cranebrook Aqueducts and the Location of Clinton' s Ditch Lock 61. This post goes out with thanks to thanks to Paul and Bunny Baker and Stan and Cheryl Longyear, who arranged for us to go onto the private land to see these remains. 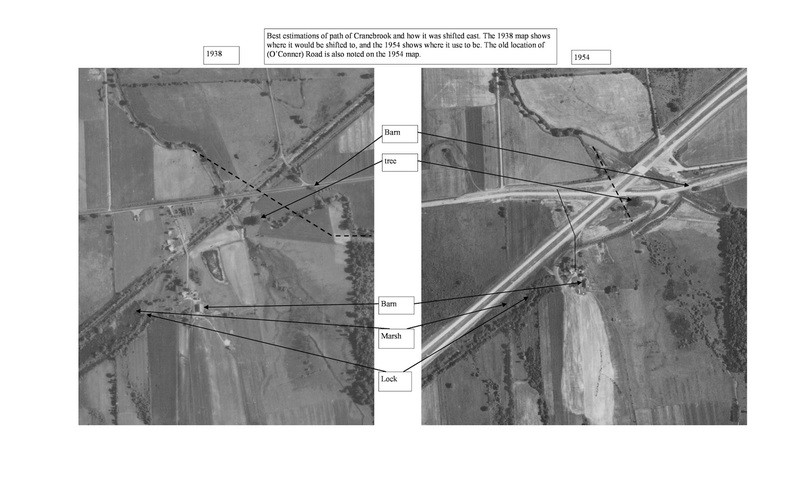 If you have been reading these posts, your will know that the route of Clinton's Ditch in central New York was winding and fraught with issues. This was mostly due to the fact that the canal was built as a contour canal and tried to follow the lay of the land. To this, add the facts that the ground was soft, and the building material, mostly being gravel mined from the local drumlins, was porous and difficult to compact. This is all to say that the canal banks between Port Byron and the Seneca River were unstable and leaked. So one of the goals of the Enlargement was to straighten out the canal, and firm up the banks. And let's not forget that the flow of water eastward from Lake Erie ended at the Seneca River slack water crossing. Other posts cover this in great detail, but quickly, the after 150 miles of downhill running from Lake Erie, the canal had to climb up over a short summit at Jordan and then downhill to Syracuse. 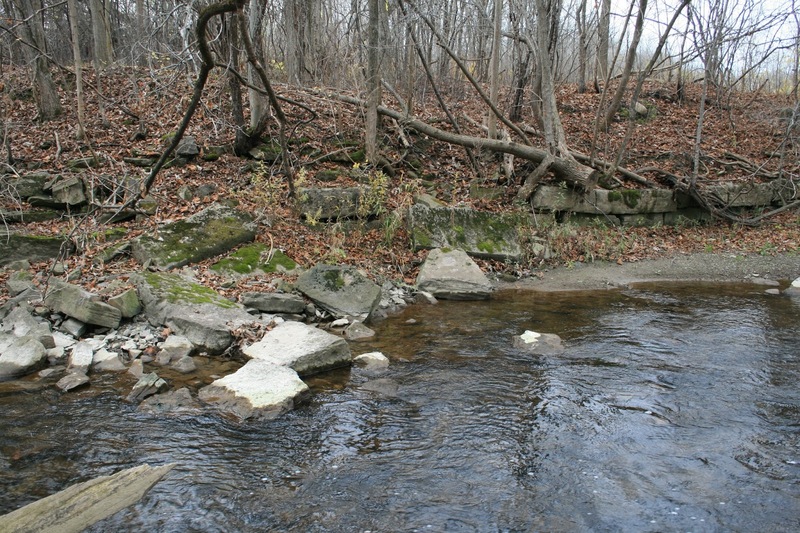 Water for this section of canal came from Skaneateles Lake and Nine Mile Creek. The water supply was limited, and the flow in the canal was impeded by the twists and turns and the porous ground. We get to see the old canal in this 1853 map of Cayuga County. The line of the canal is shown as a dashed line and you can see the new canal to the north. 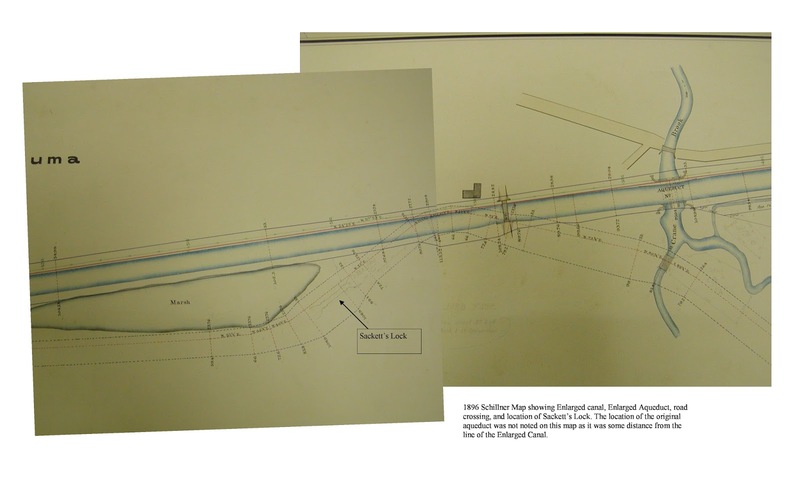 To eliminate these issues, the canal was straightened, Locks 60 was replaced with Enlarged 52 in Port Byron, and Locks 61 and 62 were replaced by the Seneca River Aqueduct. Looking for it today becomes difficult as the land has been greatly altered by the construction of the NYS Thruway. Look for my posts detailing where the first canal is south of the Thruway and the Enlarged canal is north of the highway or under it. AND much of the land is in private hands. I don't enjoy getting shot at, so permission is always asked. 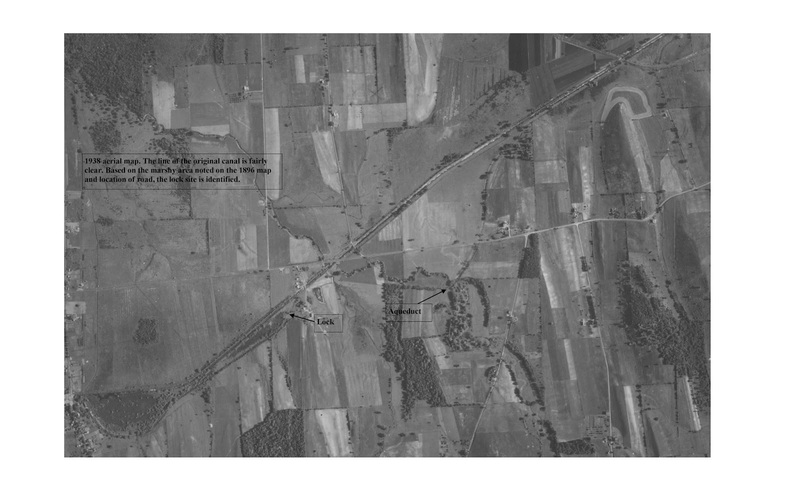 The Cranebrook aqueduct is on a large loop that hugged the contour of the land. If you are on Rt 31 east of Montezuma, look for the billboards that are set into the hillside that face the Thruway. Here you can see the bill boards in the trees. They are on the Ditch canal route. If you turn around, you see this depression and line of trees. The aqueduct is about 300 yards from here. 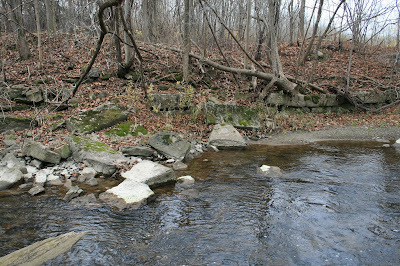 This section of canal was last used in September 1854. Although the new Seneca River Aqueduct would not be ready for use until 1856, the canal was in such a bad condition that the State was forced to use the new Enlarged canal route between Port Byron and Montezuma. 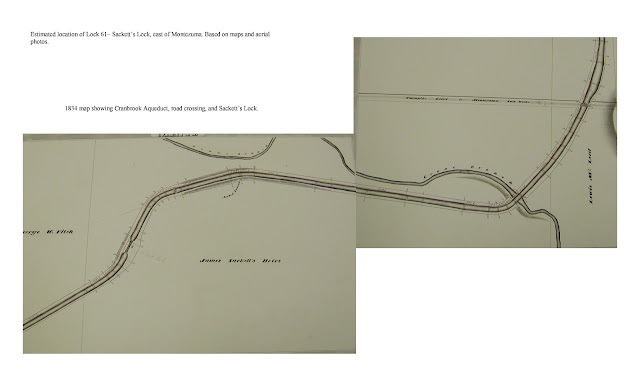 So a boater on the canal had to cross the Seneca River on the slackwater crossing, pass through a temporarily enlarged guard lock at Lock 62, pass through a section of old canal to reach the new line, use the new line between Montezuma and Port Byron, and then reenter the old canal between Port Byron and Weedsport. 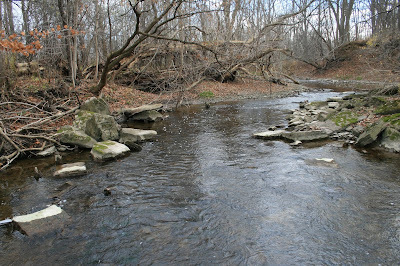 This state of affairs was somewhat eased with the opening of the Seneca River Aqueduct in 1856, but the canal issues in Port Byron were not settled until 1858. So let's get on with Cranebrook Aqueduct. There isn't much to see, but there is enough. Here we see Stan standing on a stone we presume is left over from the aqueduct and is looking at the stonework on the southwest bank. 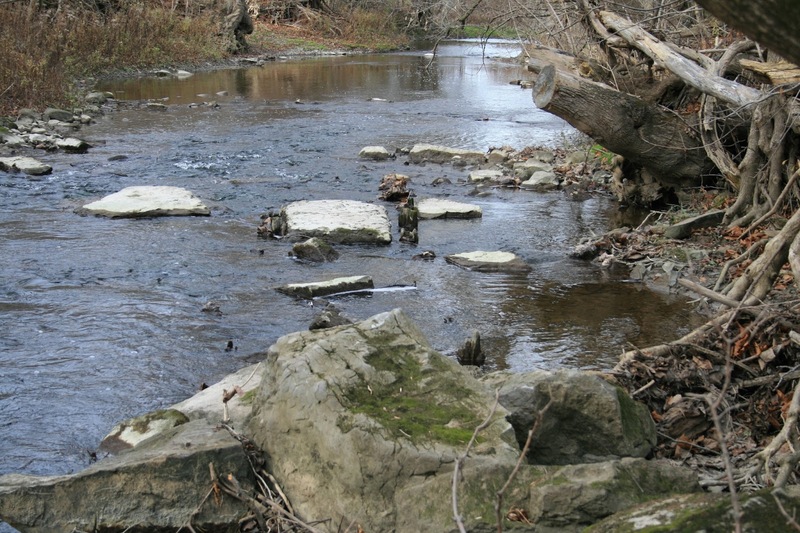 It is likely that the stones were reused or removed to help ease flooding issues. 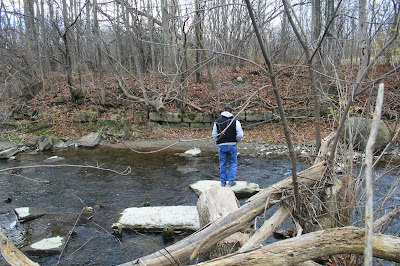 Standing in the creek, we can see wooden piling from the foundation. 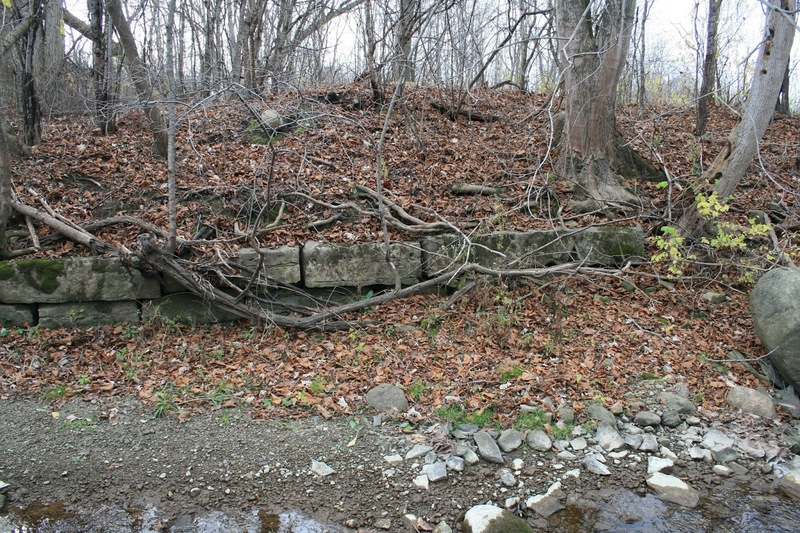 The Enlarged Cranebrook Aqueduct was located quite a ways downstream, but the building of the Thruway and the shifting of Rt 31 to cross it removed all traces of it. After visiting the aqueduct, we went looking for the Sacket's Lock, which would have been lock 61. Being a smart guy, I though I knew where it was, and in fact, I even pointed out where it was to the assembled masses (all 4 of them). But after my return home, and doing a quick desktop survey, I realized I was very far off in my guess. I did the study as a Publisher file, and I am too lazy to recreate it all here. So I converted the file to a pdf and then to a jpeg so I could post it here. Click on the photos and they will enlarge for you. 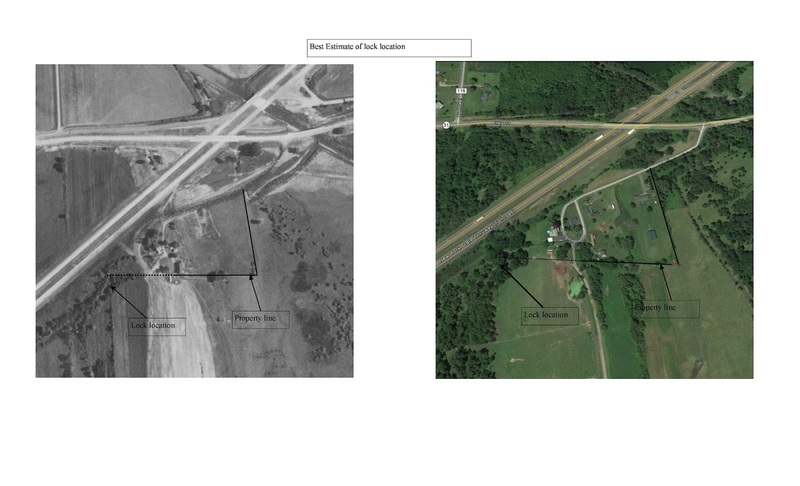 So to close this out, let me again say that the old structures are on private land, and we had permission to access. Please don't trespass. I'm really enjoying your site. Thanks for all the info. Really great info, thank you sharing it with us! Thank you, great info and very interesting!